Summons a Flame Atronach for 60 seconds wherever the caster is pointing. Conjure Flame Atronach is an apprentice level Conjuration spell that summons a Flame Atronach to aid you in combat. Summoner, increase range to 48 ft at first rank or 72 ft at second rank. Atromancy, extends duration to 120 secs. 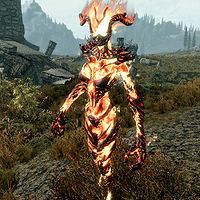 Elemental Potency, summons the more powerful Potent Flame Atronach. Spells with a line through them are not available in game. This page was last modified on 26 March 2014, at 05:27.